I am blessed enough to have a few people in my life that I consider good mentors. Funny thing, though: they are not actually aware that I consider them mentors. In his New York Times Op-Ed piece, The Myth of Quality Time, Frank Bruni talks about the importance of the unscripted moments we may choose to spend together with people we love, and the impact those moments can have. Such is my relationship with my “mentors.” I have gleaned more from fleeting conversations about life in general than I think I ever could from scheduled hour-long sessions spent over a cup of tea. I have learned, though, that those moments have to be intentional. To get the answers I need, I have to ask probing questions. So I am learning (and relearning) how to do this. Case in point: Henry Musangi. As stated in my earlier post about him, he is quite hard to pin down. But the moments we do get to spend in conversation are always worth it. I was adamant, in my mind, that this discussion had to happen. Not just for my sake, but for the sake of those who might read this and benefit from it. In transcribing this interview, I was reminded again of our need to share our lives with each other. Not just from a professional standpoint (and believe me, Henry is the consummate professional), but from a personal one as well. Because, sometimes, the two reinforce each other. When I was in my third year of undergraduate school, I seriously considered dropping architecture altogether and pursuing something else (“Do you have a Plan B?” I remember someone asking when I first raised the issue). The works of Samuel Mockbee; the concept of an altruistic architecture; the pursuit, not of fame but of the betterment of society – all this seemed overlooked and under-emphasised in the school I attended. I was somewhat disillusioned during that year, and was just tired of what I believed was an exercise in futility. At the time, I was taking an elective class which necessitated (in my professor’s mind, at least) a visit to the Yale campus to check out the buildings by Kahn and Rudolph. It was on that trip that we stopped at a little café to have lunch. During that lunch that I decided to ask my professor (he chose to sit with the ladies, big win for us) why it was that he had chosen architecture. And it was his answer (unbeknown to him) that served to bolster me. His honest, albeit edited response was a testament to the struggles that all students of architecture face. It was encouraging to know that I was not alone. My interview with Henry was scripted. It was scheduled. But there were moments – and many they were – that were unrehearsed. Things he said and pointers he gave that I actually try to apply in my life. My point: I hope this helps you as it has helped me. My questions are in bold italics; Henry’s responses are in regular typeface. This one’s a bit long. Grap a cuppa, settle back, and enjoy. Let’s go back to your years in academics and your years in the US – do you think there’s a distinction in the US work ethic vs. the Kenyan work ethic and do you think your years in Kenya prepared you for what you faced in the US? Well, I’m glad I hadn’t yet worked in Kenya, really, before I went to work in the US. The only person I ever worked for was my dad after high school, and that was just, you know, clerical stuff in his office – like a “summer” job. So I’m actually glad that my whole [architectural] experience was in the US before Kenya, you know? It was boot camp. Literally, it was based on military camp! But I was like, for some reason, it was so easy to understand it in university. Because it was a whole different context, a whole different way of learning. So you absorb it in a different way. Yes! And then, you’re less stressed out and the like, you know, ‘cause life is more balanced and the like, and … and so, that was good. I mean, beyond university itself you make a lot of friends around the neighbourhood, among professors. I was also pleasantly surprised that they were not these overarching authorities, but they actually became friends. Yeah. So that was a pleasant surprise. Towards the end you start getting the challenges going towards thesis, and you’re having to do major presentations with exceeding requirements for thoroughness. But we got through that. The years flew by very fast, I must say. Winters [however] were always like snail’s pace. Winters went too slowly for me. That was a difficult adjustment. Yes, yes. It was a bubble, completely. I remember that experience so vividly. And then I realised [that] I did not even know that sometimes jobs are hard to get, you know? I went for one interview – I remember the first interview I went for. In fact, I remember the name of the company very well to this day, because I guess they decided to ask me trick questions. They started asking me if I was willing to water the plants in the office every day and the like. For real. I remember that very well. I went to another practice and they said they did not have any jobs, but they were highly recommended. Eventually I found out at my church that a whole bunch of people there knew some of the people at that company. So people started calling the firm’s principals! Favour, you know! You thought that works in Kenya only? It works in America. But in a non-corrupt way – word-of-mouth recommendations. I worked at that place and I thoroughly enjoyed it, you know. The pay was peanuts, but it was a lot of fun. The experience was a lot of fun. Do you feel like you had a good support system? I think what really, really was my support system was church and fellowship and the campus ministry, Chi-Alpha, that I was really involved in. And that was a very international, diverse group of students. Very good mentors – the pastors were superb disciplers. In fact, there was a whole portion of my week that was just centred around Chi-Alpha. If it wasn’t for that, things would have been very hard. So, yeah: things worked out I guess by God’s leading that way. Then eventually, after graduate school I had another job – now this one in Baltimore (the new job) was far more professional. At Image Architects I’d just been doing drafting and office duties. Then at CSD they literally … I was kicked out of the bird’s nest … [I had to] run projects, meet clients, do correspondence, go to sites constantly. My tendency was to be in the background, you know … so then getting kicked out forced me to step up and step out. I try to do that now with all employees, even brand new employees. I say, “I don’t want you to spend 3 years like me [being in the background],” even though I enjoyed Image Architects. Naturally most employees – unless they are strong-willed personalities – will stay in the background. They’ll be too timid to step out. I have to constantly remind them that they have permission. Or I drag them out because some also don’t want to step out, you know? I force them to come along. What kind of advice would you give someone who wants to pursue architecture? I think they should first of all really be sure [that] it’s what they’re good at, not do it because it’s an “elite” career like medicine. Yeah. So the passion has to be there. The passion – well, some people might have the passion but they’re just not … it’s not for them, you know? They shouldn’t do it because – you know, I find in Kenya … there are certain careers that people say are kind of elite, you know. Medicine, law and the like. And people only do them because of that. I say if you’re doing it because it’s [up] there with medicine and law and you think you’re going to earn money then oh, God have mercy on you. I had a good friend; I remember she did architecture as a major and French as a minor. And I always thought that was very interesting, because I also started out my first year of undergraduate doing French as well – that’s how I got to know her well, because she and I were the [only] two architecture students in the French programme (laughs). But she carried it through to fourth year, so she got a minor degree in French. And you know, people might not see the relationship [between architecture and French] but one exists – you can craft your own relationship between those two subjects. Yeah. Basically, you can tailor your own degree. Nor are they academic. They just have good, old-fashioned wisdom, you know. Yeah. They’re sensible. They’re just sensible. And then craft it from there, together with the university [and] the professors. University education is not like high school … university can be very custom-tailored, customised to each and every individual. That’s a good thing with university. Hopefully UON* and Jomo Kenyatta* are similar to American universities [where] every single student can customise their education. David Mutiso. Click on image for source. Yes! I did consider it! When I first went to graduate school my first year graduate school assistantship was in teaching. I was teaching undergraduates, which was a lot of fun! A lot of fun. Drawing. They had a general studio on how to see, perceive and draw. Sometimes we would go out, and I’d just give them a tonne of exercises on freehand drawing, mostly. It wasn’t anything technical. The main professor led half the classes; I led the other half. So it wasn’t like they were [entirely] left to me. We would go to different corners of the campus [or] the city of Knoxville and we’d just say, “ok, today’s exercise is to draw this and that.” Or, I’d give them time limits, you know? Like, “one minute – you’ve got to draw that building. Capture that building.” It forced them not to think too hard. And that was the sort of exercise, you know, to try and get people from being too rigid. It seemed like a silly exercise but it was an important one. So … for a whole year I did that, you know. Very many exercises, all around drawing. Then, believe it or not, when I came back to Kenya, also not knowing what the professional architecture field was like, I came back with the intention to be a lecturer. [You know] the architecture department at UON? Believe it or not I interviewed and they then promptly rejected me, said I’m not qualified enough to lecture (laughs). The funny thing is [that] I keep hearing [that] now they’re begging anyone with a master’s degree in architecture to go and lecture because they’re short on lecturers. What you were looking for was a full-time position. I was actually looking for a full-time position, but even part-time they would not, ‘cause I remember bringing that up. They would not. They just promptly smiled and said hell no. This goes back to what you were saying about the Beatles. They’re going to eat their words! (Laughs). Anyway, I said that’s fine. And after that I remember going back home flabbergasted, and I said, “let me apply to architecture firms and see what I can get.” And that worked out very well. Because, actually, the other thing – the aspect of it that was being pushed – it was my dad who encouraged me to go into academia, because he spent his whole career in academia. So I kind of realised that while I enjoy teaching, this one (at least here in Nairobi) is not for me. [I said,] “let me now determine what I’m going to do.” So I sent out CVs and got three job offers. But it’s something that’s not completely off the burner, right? It’s not completely off the burner, but I said [to myself] I would pick the institution very carefully now. Very carefully. I’m not sure UON is the best (even though it’s the biggest) anymore. I admire the crop of professors who studied architecture at Technical University (what used to be Kenya Polytechnic). Very, very well turned out group of new, young professors who I really admire. Technical University’s architecture programme has got superb potential. Alright. I’m about to switch gears. If you had the day to spend with anyone who had any say on how architecture and planning in Kenya should be done – any Robert Moses of the day, let’s put it that way. What would you say to them? Ah, that’s interesting. I have actually spent some time with a whole bunch of people with clout in Nairobi county when it comes to planning. I’m more than convinced that all these people know what should be done. Their problem isn’t that they do not know what should be done or how to do it. They are thoroughly aware. It’s just the politics around their offices that messes things up. So there’s nothing I would educate them on. In fact, if anything, they are the ones who should be educating me, from [what I have gathered from] my interaction with them. I just think it’s the systems and the politics. Our problem is that we need to get together something (urban management guidelines, for example) that cannot be sabotaged by politics. [We need] serious transparency – I say that’s the way you overcome, because I’ve realised that dirty politics and corruption thrives on anonymity. So all we have to do is overcome that. The principles are well known, even to the county government and the like. But because of the secrecy and that sort of anonymity that’s when things fall apart. We know that at some point last year, Nairobi launched a new masterplan … I logged onto every Nairobi county government website and the masterplan report is not even there. It isn’t on the Nairobi websites. …to download, you know? That’s just one example. Oh my goodness. That’s a good answer. I was expecting a whole list of things that you would bring up. They do. You’re right; they do. They are well-educated, well-informed, well-travelled. Exposed. You’re absolutely right. It’s not a case of not knowing. It’s just a case of not doing. What do you think, whenever you move around on a daily basis, that Kenya needs? What do you think Nairobi needs? (Sighs) I think not just Kenya but everywhere around the world [what is needed is] good projects … that are affordable. 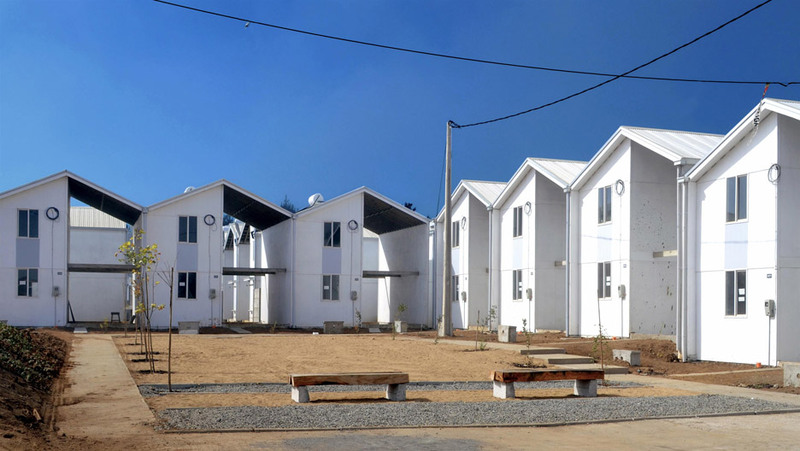 One of Alejandro Aravena’s incremental housing projects. Click on image for source. Yeah! You’re right – they’re expensive! We’re not encouraging Kenyan entrepreneurs because they are so locked out of even having a place where they can start, you know? Everyone has to start their office in some back-of-the-woods shack. It’s very unfortunate. Or housing. People end up doing these crazy-looking apartments without any dignity to them. I think, for me, affordability would be it. That’s another good answer. How do you balance your personal and professional life? (Laughs) I cannot tell you how many people have confronted me about that. ‘Cause I do very poorly there. I think I’ve gotten too much of a mission-minded sense that I’ve veered too much toward professional life … I’ve got to rebalance. I’ve got to find other things that drive me. If there was ever a time that I had it balanced, it was years ago, because I had two passions: church and fellowship was one big passion, and school and career was the other big one. Do you think it’s the same for your peers? Some of them. Not all. Many of my peers who are married tell me [that] when you get married life is no longer as linear as it is when you’re single. And I think that’s true not just for [people in] architecture – [when you have a family] you’re not just living for yourself anymore. Yeah. So they end up focusing a lot more on family issues. Some people, I find, swing to the other end of the pendulum where they neglect their professional duties under the constant excuse that they have family issues to deal with, especially here in Kenya. It’s a trend you find in Kenya a lot … Anyway, I’m not there – I wish I could say I knew how to balance, but I don’t (laughs). I’m managing. I’m determined to get back into my hobby which was photography. There was a time I told somebody [that] if I ever was to drop architecture I’d become a chef. What followed was a digression into the world of cookbooks, cuisine and the proper recipe for red snapper. Hardly befitting a blog on architecture and urbanism. What can I say? You had to be there. Moving on. So what’s a typical day like for you? A typical weekday? And then I go to my computer, read whatever emails may have come in and I try and launch my tasks as soon as possible before people come in and start chatting me up. Often, I find that within one hour of the rest of the office coming in, my presence is requested in this meeting or that, or somebody has called me … my agenda is set for me. If I’m lucky I’ll sit [at my desk] straight through and actually do work. I only find that happens on weekends though. Do you deliberately set aside a day of rest? Or are you constantly working seven days? Chill. And quite often on Sundays I also just wander around downtown. It’s not crowded on Sundays. That’s what I like about it. So back to your typical day – once you get home you’re in shut-down mode? Actually by about 4:30 in the afternoon if I’m still in the office my brain is shutting down (laughs). As soon as I get home I prepare dinner. Mostly it’s [already] cooked (I don’t cook every day; I cook en masse). As soon as I get home I have dinner. Quite often before the sun sets … 6-sh, 6:30. Absolute latest 7pm. I enjoyed this read!!!!! Had no idea Part 2 was already up. Thanks for sharing! This is inspiring and refreshing. Also… Glad I’m not the only one who does meals in phases :).